We like this new OptixCam 1080p LVDS camera. It is better quality than the old HDMI 1080 in every respect with double the functional resolution, an expansive, 11.6-inch display and an improved on screen menu system, all at the same price. The TFT-LCD display offers vivid resolution and exceptional off-angle viewing capability and with a standard C/CS mount, the new camera attaches to any standard trinocular microscope. The CX3 display finally brings a useful sized monitor to the world of industrial inspection, laboratories and schools. At 11.6", the display is a pleasure to use with good on screen controls and a remote control. A standard SD card slot allows you to conveniently transfer files without the need of a SD card reader on your PC. A particularly useful feature is a cross-hair generator that enables up to six on-screen, cross-hairs. Other features include auto white balance, RGB adjustment, auto and manual white balance, auto exposure. The camera has a standard C/CS mount. 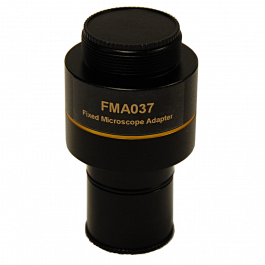 A C-mount adapter (not included) will be necessary to mount the camera to a microscope. AC Power adapter, Remote Control, Image capture device. Dimensions: Display - 9.25" x 6" x 0.5"; Camera - 3.0" x 2.5" x 2.5"; Combined Wt. - 2.7Lbs. We like this new OptixCam 1080p LVDS camera. It is better quality than the old HDMI 1080 in every respect with double the functional resolution, an expansive, 11.6-inch display and an improved on screen menu system, all at the same price. The TFT-LCD display offers vivid resolution and exceptional off-angle viewing capability and with a standard C/CS mount, the new camera attaches to any standard trinocular microscope. FeaturesThe CX3 display finally brings a useful sized monitor to the world of industrial inspection, laboratories and schools. At 11.6", the display is a pleasure to use with good on screen controls and a remote control. A standard SD card slot (card not included), allows you to conveniently transfer files without the need of a SD card reader on your PC. A particularly useful feature is a cross-hair generator that enables up to six on-screen, cross-hairs. Other features include auto white balance, RGB adjustment, auto and manual white balance, auto exposure.The camera has a standard C/CS mount. 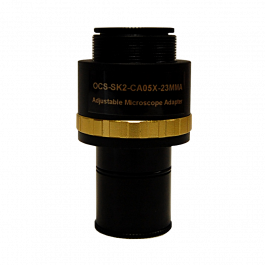 A C-mount adapter (not included) will be necessary to mount the camera to a microscope.LVDS technology offers a number of key benefits to digital microscopy, including richer color definition, better signal integrity, greater bandwidth capacity, encryption protocols and high-definition video. The CX-3 showcases this technology in an affordable and versatile package for the biology classroom, industrial inspection line or clinical teaching laboratory.AccessoriesAC Power adapter, Remote Control, Image capture device.Dimensions: Display - 9.25" x 6" x 0.5"; Camera - 3.0" x 2.5" x 2.5"; Combined Wt. - 2.7Lbs.